Is this one made by spamreality? what do u mean for spamreality? Do you have something to contribute with, in terms of gadgets to post? Cool seat ! Did you @MarcoBalletta have the chance to test that one? I have ordered the 3 dof with the upgrade to 6 dof. The 6 dof is a pre order because it is in developing as we speak. So, I was crazy becaue I prepaid for a 6 dof rig that is being build right now. They told me that the 6 dof will be ready in 4 -5 weeks. So I have no picture or nothing to show about the 6 dof. Cool Thanks for the info, I look be scanning for you update. VR wheel? Why not a classic thrust master or Logitech? And I think the kickstarter price is “affordable” compared to other wheels and pedals that are offering more or less the same specs. How this wheel is better than feelvr? Dirt 3 is pretty cool with it and easy to drive with it. Project cars 2 is so hard instead to drive with this. I do not think I would be a proper reviewer because I have no experience on motion simulators and now that I have one I see how much tweaking is needed for optimize it according to our preference and to as much as possible realistic movements we can. I am waiting myself reviews and comparison from p3 or h3 owners that updated to p6 or h6 so I can ask questions about settings. I think I am not good at all at setting up the rig properly . I see videos of the p3 or h3 with cool movements that I do not think i am capable to resemble because I am not good at setting the p6 properly. It is like having a super cool boat but without knowing how to seal it. Ah ok. Thank you for that info. this kind of thing is new to me too. I just presumed that sites like simexperience or xsimulator would have member made game profiles for motion rigs & maybe settings would be tweaked via dofreality software. I guess it’s a bit more complicated than I thought. I do not think many ppl at all have 6 dof rigs, this the problem. They are expensive and the most “affordable” is the 6dofreality. I do not think many profiles for 6 dof are around and plus I think they are rig specific and also part of the tweaking is based on personal taste. Sure, You can make a video. tune the % values to your preference and realism. We suggest to start from lower values and go up as some games maybe super sensitive. Yeah that looks quite time consuming having to do the work yourself. I have a sim tools license & i hoped by buying the sim tools license, profiles would be available for 3dof & 6dof already. I expect I will have similar trouble when it arrives. I guess if you spend time doing the work for your rig, once you have a profile set, it should be as easy as loading it up each time. It’s a shame that dof reality haven’t included access to a bunch of basic profiles for popular sims. Yeah tweaking to feel real can be very time consuming and difficult. I hadn’t thought about the fact so few people have 6dof sim rigs of any brand that riding off the back of other people’s work wouldn’t be so easy. Try to link up with as many owners as possible and start sharing the knowledge learnt is the best advice I have. Although every rig is different, usually basic rules still work…if you drop the ratio of x compared to y then z feels better etc. I’m keenly watching how you’re getting along with it. If you’re feeling like spending money in future I’d highly recommend upgrading your wheel. I went from the logitech to a Fanatec Clubsport 2.5 and wow did it improve the realism 100 fold. You realise the fidelity is like comparing a cheap transistor radio to sitting in amongst the orchestra. You really feel the car, every little bit, and it’s powerful! 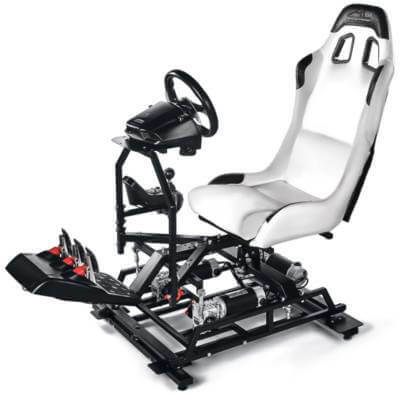 There’s other really good ones too and Fanatec recently released a direct drive wheel so there’s the option of going higher or buying a Clubsport 2nd hand from someone upgrading to the new DD. DOF reality has got profiles for the 3 dof rig that they sell for a while now. DOF Reality just produced and started selling the 6 dof and they are working on 6 dof profiles. The question you should ask yourself is if the 3 dof you backed will offer any 3 dof profiles, because I think each rig has their own main profiles and game profiles. The main 3 dof profile for your backed rig should not be a problem. The game profiles for your backed rig, are a different story. After you make game profiles for each game, it is a matter to just upload them and start the game and play. Time consuming and challenging is the creation of the game profiles. iRacing and Dirt Rally 2.0 for 6 DOF dofreality has been also posted. Have you tried the new settings? How is it?